Porto Alegre prepares to be a host city of the 2014 FIFA World Cup by planning three bus rapid transit (BRT) support projects. Photo by Guilherme Santos/PMPA. 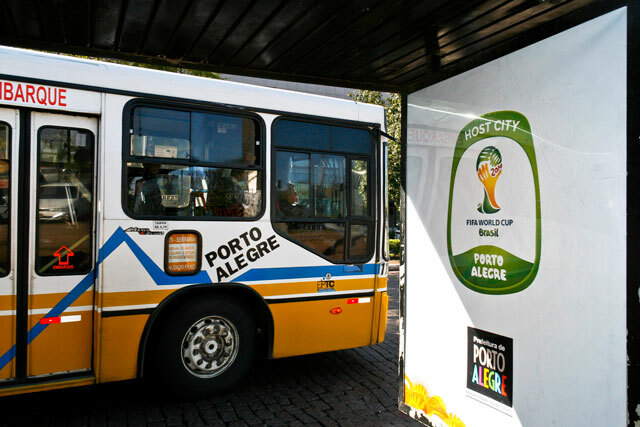 Porto Alegre, Brazil has submitted three plans for bus rapid transit (BRT) supplemental projects to support Brazil’s hosting of the 2014 FIFA World Cup. Boston’s new bike share program finished its first month of service with 2,319 annual subscribers secured and 36,612 station-to-station trips recorded—first month figures surpassing that of Denver and Minneapolis. The U.S. Department of Transportation allotted $ 1 billion to the Eagle P3 commuter rail project in Denver. The 30-mile rail system is expected to create 4,700 jobs, ease traffic congestion and increase mobility. The Rajkot Municipal Corporation (RMC) in association with the Institute for Transportation and Development Policy (ITDP) held a workshop this week to promote non-motorized transport in Rajkot, India. The Bicycle Transportation Alliance hosted a bike share system demonstration in Portland, Ore. to aid in the city’s consideration of a future bike share system. The U.S. Access Board released its “Proposed Accessibility Guidelines for Pedestrian Facilities in the Public Right of Way” for public comment. IBM released its fourth annual report on the worst cities in the world for commuting. The list included 20 of the world’s top 65 cities in regards to size and economic activity. Pegasus Global Holdings, a Washington, D.C.-based company, is commissioning the construction of a 20 square-mile, $20 million city that will not house residents but will instead function as a testing site for various urban-related technologies and projects. MIT Media Lab and Macro Connections are collectively investigating people’s perceptions of cities using a new online interactive project called Place Pulse. Join the project here. The City Form Research Group released an ArcGIS toolbox for free download for urban network analysis, which includes the study of cities’ environmental, social and economic processes. To raise environmental awareness, Bolivia’s government banned the use of motorized vehicles, including public transport vehicles, from cities across the country on Sunday. A new report from a University of Michigan Transportation Research Institute (UMTRI) research team found that not following good eco-driving practices can reduce on-road fuel economy by as much as 45 percent. The Australian government released a discussion paper that outlines issues involved in setting CO2 emission standards for the country’s light-duty vehicles, as well as welcomes feedback from both industry officials and the public on setting appropriate standards. The U.S. and Chinese governments encountered conflict on potential trade parameters surrounding the sales of Chevy Volts in China. Research from the U.S. National Center for Atmospheric Research indicates that switching from coal energy sources to natural gas will not be sufficient in abating climate change. The state of California followed the precedent of other states by approving a three-foot bicycle-passing rule. BMW Group Research and Technology is developing advanced automated driver assistance systems for use in personal vehicles. Advocates of health, environment and transport are asking candidates in London’s 2012 mayoral election to commit to city-wide 20 mile-per-hour vehicle speed limits, if elected. Thirty fashion industry figures designed bicycles for rent as part of New York City Fashion Week’s Tour de Fashion program. Transit Hack Day 2011 will be held this weekend in Arlington, Va., bringing together mappers, developers and transit data enthusiasts to collaborate and explore the creation of transit maps and visualizations. The state of Virginia is hosting Try Transit Week on September 19-23, during which time residents who don’t use public transit are challenged to do so at least once. “Overdrive: Istanbul in the New Millennium,” a film exploring the challenges of urbanization and sustainable transport in the Turkish capital, is screening at multiple film festivals this fall. “Overdrive” was produced by EMBARQ, the producer of this blog.